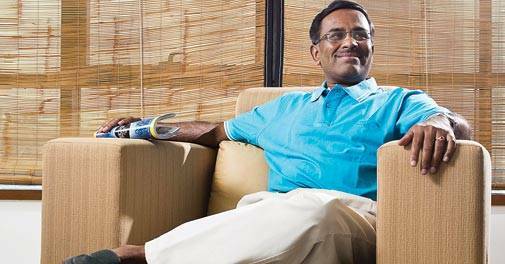 Vikram Limaye, who took charge as Managing Director and Chief Executive Officer (CEO) of the National Stock Exchange (NSE) on July 17, has the unenviable task of steering the country's top exchange out of the kind of troubles it has rarely faced in its 25-year-old history. The biggest has been the bad press it has been getting after allegations that some brokers at its co-location facility got preferential access to market data. Then, this July, its system faced a glitch, resulting in halting of trading in two segments - Cash and Futures & Options - for three hours. Then there is the issue of initial public offer, or IPO, that some shareholders looking for an exit have been pushing but which has been stuck due to one reason or the other (the latest is the probe into the co-location facility issue). After long innings by insiders such as Ravi Narain and Chitra Ramkrishna, can Limaye, former Managing Director and CEO of IDFC Ltd, turn the tide and take the exchange forward? Limaye is confident, but it will not be easy. In Limaye's own words, "Resolving the co-location issue is the priority." Why? "Because it has been going on for some time and relates to the period from 2010 to 2014. We want to see it is resolved as soon as possible," he said. Within three days of him assuming office, the NSE applied to the Securities and Exchange Board of India, or Sebi, for settlement through the 'consent mechanism,' which allows for settling of cases without admission or denial of wrongdoing by paying a fee. "The consent process may be the fastest way to resolve the matter," says Limaye. A co-location facility hosts servers of members who do high-frequency trading on the exchange's premises (the closeness gives traders a time advantage over others). Preferential access means some brokers got split-second faster access to market feed data. The issue has been in news since early 2015 when it was first brought to the notice of Sebi. Deloitte Touche Tohmatsu India, after a forensic audit, found that preferential treatment was given to a few members in dissemination of trade data for over a year till April 2014. Later, the NSE replaced the Unicast technology, which gives out trade data based on the sequence of logins, with Multicast technology, which disseminates data to all subscribers simultaneously. The NSE, which claims to have noticed the "misuse" of the co-location facility by some members and says it also warned them, seems to have failed to act against the perpetrators. This is at the heart of the regulatory probe now. Though the NSE initiated its Rs 10,000-crore IPO process in December 2016 by filing a draft red herring prospectus, it may have to wait till the co-location issue is resolved. "The IPO will depend on when the issue is resolved," says Limaye. The communication from the exchange during the July 10 glitch could have been better, say members. That day, the market was agog with rumours around the reason for the glitch, till the NSE issued a clarification in the evening ruling out a cyber attack and explaining why it did not opt for a business continuity plan or BCP. "The exchange should have told brokers and investors about what happened. It should have also informed about the reasons and the action taken," says Ashish Kapur, CEO, Invest Shoppe India. The NSE chief has also identified "timely communication" as the key area to be addressed. Referring to the co-location issue, which has scarred the NSE's image, Limaye says, "If the issue had been handled better with the regulator as well as the media, it would not have got to this point. I think it just requires better communication." "We are in the process of improving our relationship with various stakeholders - regulator, government, media, clients, shareholders, employees, etc. For the last few years, for some reason, the relationship with shareholders was not what it should have been," says Limaye, referring to this as his second priority. Though glitches in stock markets are not unknown, June 10 was an important day for traders as new rules related to Participatory Notes had come into force that day. The market opened short and went up. "A day like that sees a lot of trading activity," says Kapur of Invest Shoppe India. Some brokerages were critical of delayed halting of F&O trading, refusal to switch to the BCP immediately, and failure to take stakeholders into confidence. However, the NSE said the BCP mechanism was usually invoked during a disaster, hardware failure or connectivity issues and preliminary assessment had indicated that it was a software problem. Sebi has asked the NSE to review its BCP and submit a plan to avoid such instances in future. "Definitely, there was an impact, even though the NSE reversed open positions in the pre-trading session. The impact was temporary as the market had just started and many investors shifted trades to the BSE," says Deven Choksey, Managing Director, KR Choksey Shares & Securities. India has the unique distinction of having two large exchanges operating simultaneously. "Many investors were seen opting for long purchases and there were few short sellers. We have not received any complaint or heard of any delays," says Deena Mehta, MD of Asit C Mehta Investment Intermediates, who is also former president of the BSE, the NSE's rival. "It is a one-off incident, but if these glitches continue, the BSE may pick up volumes," says Kapur. Limaye says the NSE's systems are fairly strong. "It is a one-off event. Such a thing has not happened in the past 20 years. That itself means the systems are robust," he says. The glitch, though a rarity, underlines the need to revamp systems and processes. "We will look at areas we have to strengthen. Besides, whatever was discussed as part of the co-location issue will be done. It is an ongoing exercise," he says. He says the NSE is confident that the systems and processes are 'robust' enough to ward off any eventuality. The exchange had referred the glitch to its Standing Committee on Technology. Since 2010, stock exchange glitches have happened on six occasions in India - four at the BSE and two at the NSE (including the one at the NSE triggered by a wrong entry made by a broking firm employee). "Investor confidence will take a beating if glitches keep happening. It is not that glitches don't happen on other stock exchanges. But the fact is that we are a high-volume market. For one trade in the cash segment, there are 18 trades in the derivatives market," says Choksey. India is second only to South Korea in the intensity of speculation. Limaye is looking forward. "As the issue is resolved with Sebi, we will move forward. As we are operating well, and if market share and other parameters are fine, we will overcome this perception as well." Referring to other priorities, Limaye listed new product launches, ramping up of businesses, GIFT City, international partnerships, and development of markets such as bonds, commodities and currencies. With Ravi Narain's resignation as the non-executive vice-chairman in June, Limaye has got a free hand to guide the exchange. Nothing stops him from delivering on his promises.